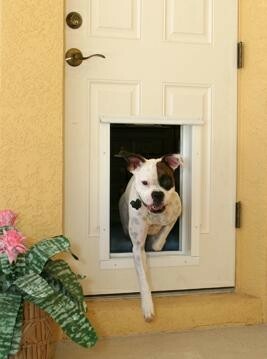 Many people find the convenience of using an automatically operated pet door very appealing. Since access is controlled by you, electronic pet doors add a degree of security to your pet's point of entry and exit to and from the home. We have electronic models for both door and wall installation, in a small choice of sizes. 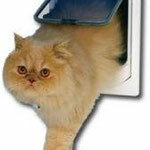 Currently we are evaluating new electronic models to expand our electronic pet door selection. In some cases, a combination of pet doors might be your best option, with one providing access from the home's interior to the garage and another for access outdoors. 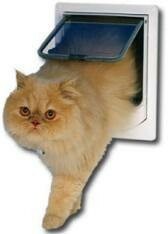 While it is advisable to use similar pet door types when two are installed, it is fine to use two different brands or types as long as you are willing to teach your pets, with a little patience, to use them. 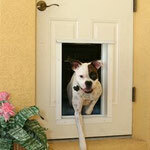 Electronic pet doors can be installed into most doors and almost any wall, including siding, dryvit, brick, or stucco. Our current electronic models are triggered by coded RFID signals to allow access to only pets wearing matching RFID tags. These types of electronic pet doors are much more reliable and accurate than older technology like infrared or magnetic activation. 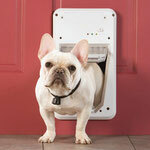 Multiple pets can wear tags coded for the same pet door, too. Several of our manufacturers on electronic pet doors, but we currently have electronic models from only PetSafe (SmartDoor) and Plexidor.